LA JOLLA—Ever since researchers connected the shortening of telomeres—the protective structures on the ends of chromosomes—to aging and disease, the race has been on to understand the factors that govern telomere length. Now, scientists at the Salk Institute have found that a balance of elongation and trimming in stem cells results in telomeres that are, as Goldilocks would say, not too short and not too long, but just right. Immunofluorescence analysis of pluripotent markers Nanog (red) and TRA-1-60 (green) in human induced pluripotent stem cells derived from skin fibroblasts. DNA is shown in blue. The finding, which appears in the December 5, 2016, issue of Nature Structural & Molecular Biology, deepens our understanding of stem cell biology and could help advance stem cell-based therapies, especially related to aging and regenerative medicine. Telomeres are repetitive stretches of DNA at the ends of each chromosome whose length can be increased by an enzyme called telomerase. Our cellular machinery results in a little bit of the telomere becoming lopped off each time cells replicate their DNA and divide. 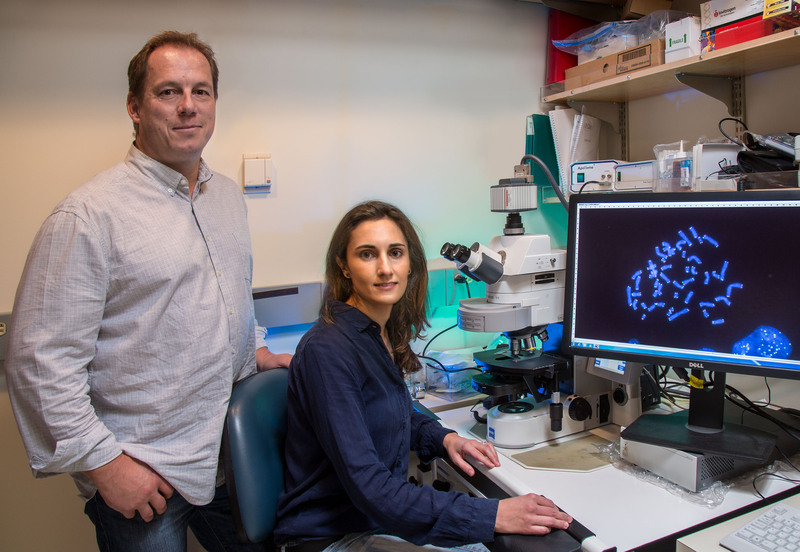 As telomeres shorten over time, the chromosomes themselves become vulnerable to damage. Eventually the cells die. The exception is stem cells, which use telomerase to rebuild their telomeres, allowing them to retain their ability to divide, and to develop (“differentiate”) into virtually any cell type for the specific tissue or organ, be it skin, heart, liver or muscle—a quality known as pluripotency. These qualities make stem cells promising tools for regenerative therapies to combat age-related cellular damage and disease. 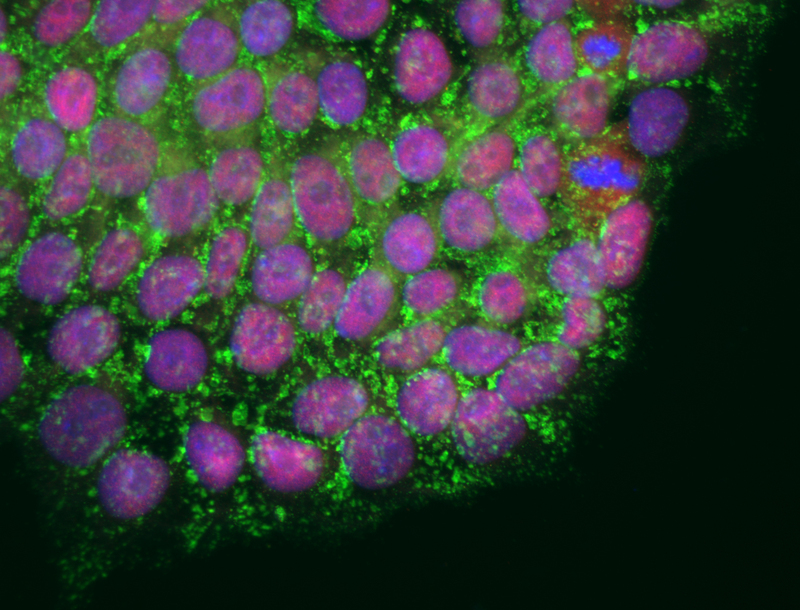 Karlseder, Rivera and colleagues began by investigating telomere maintenance in laboratory-cultured lines of human embryonic stem cells (ESCs). Using molecular techniques, they varied telomerase activity. Perhaps not surprisingly, cells with too little telomerase had very short telomeres and eventually the cells died. Conversely, cells with augmented levels of telomerase had very long telomeres. But instead of these cells thriving, their telomeres developed instabilities. The team observed that very long telomeres activated trimming mechanisms controlled by a pair of proteins called XRCC3 and Nbs1. The lab’s experiments show that reduced expression of these proteins in ESCs prevented telomere trimming, confirming that XRCC3 and Nbs1 are indeed responsible for that task. Next, the team looked at induced pluripotent stem cells (iPSCs), which are differentiated cells (e.g., skin cells) that are reprogrammed back to a stem cell-like state. iPSCs—because they can be genetically matched to donors and are easily obtainable—are common and crucial tools for potential stem cell therapies. The researchers discovered that iPSCs contain markers of telomere trimming, making their presence a useful gauge of how successfully a cell has been reprogrammed. “Stem cell reprogramming is a major scientific breakthrough, but the methods are still being perfected. Understanding how telomere length is regulated is an important step toward realizing the promise of stem cell therapies and regenerative medicine,” says Rivera. Other authors included Candy Haggblom of the Salk Institute and Sandro Cosconati of the Second University of Naples. The work was funded by the California Institute for Regenerative Medicine training grant TG2-01158, the Salk Institute Cancer Center Core Grant (P30CA014195), the National Institutes of Health (R01GM087476, R01CA174942), the Highland Street Foundation, the Fritz B. Burns Foundation, the Emerald Foundation and the Glenn Center for Research on Aging.